Just in time for Halloween, FlamesRising.com is pleased to present you with advice on terrifying your players from veteran game designer John Wick. 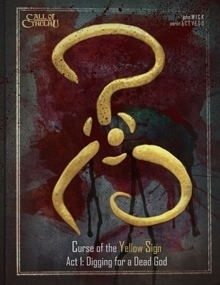 Games that John has designed recently include the Lovecraft-inspired CURSE OF THE YELLOW SIGN and HOUSES OF THE BLOODED. For more about John, visit his website located at John Wick Presents. Every Halloween, I run Call of Cthulhu. It’s a tradition. Something I’ve rarely broken. Every year, I dress up in my “Man in Black” outfit (black pants, black shirt, black vest, black jacket, black tie, black hat and Yellow Sign pin) and I tell a story of man’s futile attempts to understand the universe. But this year, for various reasons, has proven to be a year of breaking traditions. I’m forty-one years old this year—forty-two on December 10th—and the whole three hundred and sixty days seemed to be a hovering point between the magic and mysticism and absurdity. Forty is the year a man is old enough to start learning magic. At forty, he is mature enough to understand qabalah. It is the year of the Magician. Forty-two, of course, is an entirely different number with its own significance. And so, at forty-one, it seemed a good year for breaking as many traditions as possible. Therefore, I’ll be running a different game for Halloween. This year, I’ll be running Schauermarchen. Schauermarchen is one of the “little games” I designed a few years back. It was a nightmare that I decided to do something with. An abandoned village full of broken windows and junk inhabited by a tall, scary man and a horde of little, hungry children. While the game may change, my tactics remain the same. In fact, running Schauermarchen opens up possibilities my beloved Cthulhu does not. And those tactics are what you and I will be talking about this evening. I look at my Halloween game as a haunted house. 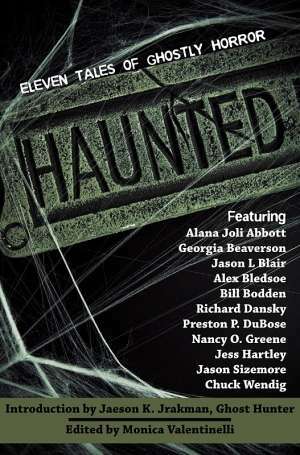 When you step into a haunted house, you go in knowing that the rules on the inside are not the same as the rules you left behind. Your players should know this. They should know that they are willingly giving up the illusion of safety for a different illusion. They want to be scared? Then they have to be willing to play by the rules. 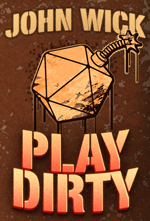 This isn’t your typical roleplaying game. This is something different. Your players should know this. If they don’t, tell them now. Tell them that they should expect anything. They should expect everything. Before the game even begins, prime them up. 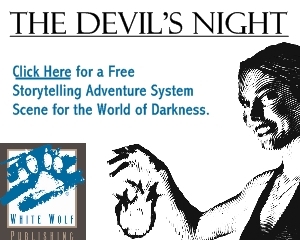 Tell them you’ve read an article John Wick—you know, the guy who wrote Play Dirty?—wrote about running a game that would scare the hell out of the players. Tell them that John guy suggested a whole ton of stuff that was just terrifying. But you won’t be using the really mean stuff. Some of it was just too extreme. But some of it… yeah… some of it was really insightful. Also, be sure to turn on the air conditioning. Get it cold in the place. Let them shiver. If they complain, just shrug. “I don’t feel it,” tell them. Make sure you are in a place where you can control the light. In fact, play in an unfamiliar place. Even if you have to play in the bathroom. Yes, I said the bathroom. I’ve done it before. Moved an entire group in there. They were crowded and uncomfortable. And it all worked to my advantage. Prime them. Get them worried before they even sit down. They are already yours and they don’t even know it yet. Once they sit down at the table, show them their character sheets. Let them look the sheets over. Or, if this is one game of a campaign, tell the players to get their character sheets out and give them one last look over. Then, when they’re ready, turn off all the lights. I mean all the lights. We need complete darkness. Let them sit for a few moments. If someone tries to make a joke or talk, give them a polite “shhhh” and let them sit a little longer. Actually, almost any of his work will do. Penderecki is brilliant at creating really terrifying atmospheres. I’m listening to the Threnody right now. It’s 3:00 in the afternoon, the sun shines through the window and my cat is curled up on my lap. I’m listening to the Threnody right now… and I’m afraid something is over my shoulder. I kid you not. Play the whole thing in complete darkness. Just let them sit there and listen. Then, halfway through the listening, get up and take their character sheets away. One at a time. Finally, use one of those light sticks. You know what I’m talking about. Emergency light sticks that you “break” and they fill with glowing liquid? John Tynes used them for lighting in his brilliant Grace Under Pressure adventure with the players locked in a submarine. They give off a weird glow that makes everything look unnatural. Use those for lighting and nothing else. Most RPGs use the character sheet as a kind of shield against the machinations of the GM. Horror RPGs are no different. All of them have little tricks to help the players protect themselves from the monsters you summon. This time, you have the character sheets. They can roll dice, but you keep the sheets. They don’t get to look at the sheets. If they forget something that’s on their sheet, that’s too bad. “Do I have pick lock?” they ask. “Roll and find out,” you tell them. If they fail, they fail. If they succeed, they succeed. But they don’t get to do any math. They don’t get any comfort from their right brain logic and reason. No, we want them stepped in the fear center. We don’t want them to have any access to the parts of the brain that tell them there’s really nothing there in the dark with them. No. We want them alone and shivering and terrified. This is a trick I’ve used several times. I used it for the playtest of Curse of the Yellow Sign, Act 3 and detailed it there. I’ll give you the synopsis. When you send out the invites for the game, make sure you have one person on your side. In fact, you may want to make it someone who doesn’t usually game with you. Tell them your plans and have them show up early. When they show up, stuff them in a closet or some other place that’s near your gaming table. Then, at the dramatically appropriate moment, have them knock on the closet door. This should be when one of the characters is alone and investigating the haunted house or a murder scene or something else appropriate. You say, “You hear a knock on the door,” and then they do. The moment will startle them. Trust me. If you’ve primed them well enough with the lights and the music and the cold, this little bit will freak the living hell out of them. Well kiddies, I have more advice for you, but I’ve hit my word limit. Get me talking about how to mess with players and I just can’t seem to shut up. Just remember this: your players want to be scared. They have shown up on Halloween to play a horror game. If they don’t, they should go play a roleplaying game where they get to be the serial killer. You know. A game where they wander around murdering everything in sight, plundering from the dead bodies and moving on without any consideration for the life they just took or the moral consequences on their conscience, becoming more and more powerful with every murder they perform. Oh, if only I could think of one. That game would be really scary. Great post! I’m running that serial killer game this Halloween! Should have thought to run CoC instead.